In the deep freeze we’ve experienced, I’ve been able to fill my time with indoor projects related to the outdoors. Whether it’s tying up a roll of walleye spinners or cranking out an inline bucktail for muskies or filling up a flybox for a striped bass trip coming up in March, there’s been more than enough to do. From the terminal tackle, I quickly transitioned to my rods and reels and came to realize that my fly lines and the reels themselves were in serious need of cleaning and the addition of some new leaders for those upcoming spring adventures for trout, bass and pike would be a must. In going through the four options I keep close at hand, I pulled all the line off down to the backing, and even added some new backing to one. In the process, I recalled all those knots (by memory, amazingly) which were required to put the combos back together and get them in shape for this spring. As I stared at the bare fly reel, I remembered the mental picture of a tree growing out of its center and recalled that the connection between center pin and backing was the arbor knot. 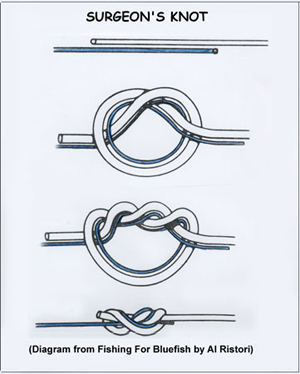 The arbor knot consists of two overhand knots; one in the tag end of the line and one in the main line through which the tag – and the first knot – are threaded through. As if by magic, the knots cinched against each other and rested snugly against the center of the reel. Within moments, the backing was spooled up. With a snip of my scissors, I provided myself with the free end of the backing and found the “connect this end to backing” tag on the spool of new weight-forward floating line. I struggled to recall the connecting knot between the two, but then remembered it was the Albright knot that would do the trick, with its large leader loop and seven wraps of the fly line around it. I struggled to get a smooth and solid connection on the first attempt, but the second time around a nice fluid knot brought the two lines together. With a few hundred cranks of the handle, the reel was loaded with the clean and straight weight-forward fly line, and when I reached the end of the lime green spool I faced an adversary which had plagued me throughout my fishing career – the nail knot. I struggled so badly with this knot in the infancy of my fly-fishing adventures that I switched exclusively to using pre-rigged leader tabs at the end of all my fly line. It came much easier than I expected with the help of a cut drinking straw, and as I tightened the knot on the second attempt, I smiled with satisfaction as the wraps settled into place and the knot formed a strong connection between line and leader. Finally, the surgeon’s knot represented my last hurdle in getting my gear ready for whenever spring decides to arrive, and I paired my leader and tippet lines on the first reel and created the loop which I ran the tag end of the leader and the full length of the tippet through twice. I moistened the knot area and with a pull of both tags and main lines, the knot came together, forming a strong bond for both leader and tippet. I completed the combo and then took each reel, pulled the line off for a cleaning and made each connection again, save for the Arbor knot, which wasn’t necessary. By the third fly reel, I was in the groove and the knots came naturally, reminding me that sometimes we can be warmed by the knowledge we have stashed in our brain and a little practice of those things that bring our fishing worlds together, no matter the temperature or time of year. Featured Photo: Reel Secure. Having the right knots to connect backing, line and leader to a fly reel will ensure a solid hookset and firm connection to fighting fish this spring. Simonson Photo.